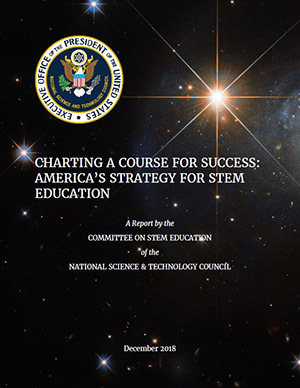 Earlier today the U.S. National Science and Technology Council’s Committee on STEM Education (CoSTEM) released the new U.S. Federal STEM Education 5-year Strategic Plan. Increase Diversity, Equity, and Inclusion in STEM and provide all Americans with lifelong access to high-quality education, especially those historically underserved and underrepresented in STEM fields and employment. The full benefits of the Nation’s STEM enterprise will not be realized until this goal is achieved. ASTC applauds the CoSTEM agencies for their commitment to providing high-quality STEM education for all, and for recognizing the important role that informal STEM education, including science centers, play in addressing these national priorities. ASTC and our members are excited to partner with Federal agencies to develop innovative new approaches to building a STEM-literate society. The Federal strategy is built on four pathways representing a cross-cutting set of approaches, each with a specific set of objectives and priority Federal actions for achieving these goals. Develop and Enrich Strategic Partnerships. This pathway focuses on strengthening existing relationships and developing new connections between educational institutions, employers, and their communities. That means bringing together schools, colleges and universities, libraries, museums, and other community resources to build STEM ecosystems that broaden and enrich each learner’s educational and career journey. It also means engaging learners in work-based learning experiences with local employers, internships, apprenticeships, and research experiences. Having strategic partnerships also means exploring opportunities within the education community to blend formal and informal learning, and to blend curricula to enable students to complete both core academic and applied technical curricula in preparation for higher education. Together the objectives under this pathway can help retain learners interested in STEM fields and develop high-quality talent for both public and private sector employers. Engage Students where Disciplines Converge. This pathway seeks to make STEM learning more meaningful and inspiring to students by focusing on complex real-world problems and challenges that require initiative and creativity. It promotes innovation and entrepreneurship by engaging learners in transdisciplinary activities such as project-based learning, science fairs, robotics clubs, invention challenges, or gaming workshops that require participants to identify and solve problems using knowledge and methods from across disciplines. It seeks to help students challenged in mathematics—frequently a barrier to STEM careers—by using innovative, tailored instructional methods. Another objective is teaching learners to tackle problems using multiple disciplines; for example, learning data science by combining basic mathematics, statistics, and computer science to study a societal problem. Such activities help to create a STEM-literate population and prepare Americans for the rapidly evolving workplace. Build Computational Literacy. This pathway recognizes how thoroughly digital devices and the internet have transformed society and adopts strategies that empower learners to take maximum advantage of this change. It recognizes that digital literacy empowers people with the tools to find information, answer questions, and share ideas, and that they need to understand how to use these tools responsibly and safely. This pathway seeks to advance computational thinking as a critical skill for today’s world. Computational thinking, including computer science, is not just about using computing devices effectively; more broadly, it means solving complex problems with data, a skill that can be learned at an early age. It seeks to expand the use of digital platforms for teaching and learning, because they enable anywhere/anytime learning; make possible individualized instruction customized to the way each person learns most effectively; and can offer more active and engaging learning through simulation-based activities or virtual reality experiences. These tools have the potential to decrease achievement gaps in formal educational settings and to offer rapid reskilling or upskilling opportunities in the workplace. Operate with Transparency and Accountability. This pathway commits the Federal Government to open, evidence-based practices and decision-making in STEM programs, investments, and activities. Complementary practices by other STEM stakeholders will facilitate the entire ecosystem to collectively monitor progress towards achieving the shared national goals of this strategic plan. These four pathways have the potential to catalyze and empower educators, employers, and communities to the benefit of learners at all levels and to society as a whole and to ensure the realization of a shared vision for American leadership in STEM literacy, innovation, and employment.